When French President Emmanuel Macron urged a joint session of Congress last month to heed the risks of climate change, his comments caught the ear of one Republican senator in the audience. 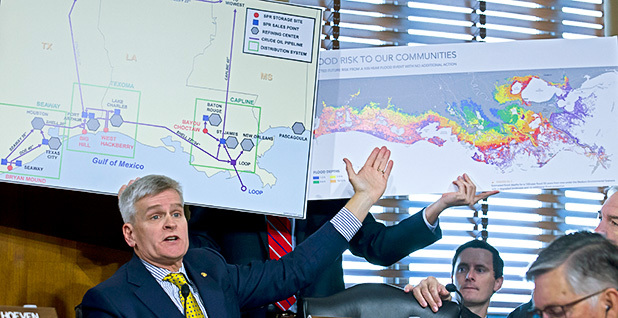 Louisiana's Bill Cassidy, whose home state is a major oil and gas producer, was struck by Macron's call for a "smooth transition" to a low-carbon economy. The message resonated with the senator in part because of a conversation on that very subject he had had the previous day with a member of the French Parliament who was traveling with Macron. That French politician pointed to the high percentage of carbon-free nuclear energy that powers his country, but conceded that Cassidy was correct when he noted that France's "nuclear base is about to expire ... and it's too expensive to replace," the senator recalled to E&E News after the speech. Also capturing Cassidy's attention were the words that immediately preceded the climate portion of Macron's speech, in which the president called for the protection of the middle class, which he called "the backbone of our democracies." Macron "made it sound like these are isolated issues which have to be addressed separately," said Cassidy, who sees the fate of the middle class in a global economy and the push to decarbonize as inextricably linked. Both points made in the speech provide a window into the mind of Cassidy, who since joining the Senate in 2015 has spent a surprising amount of time and energy thinking about climate change. 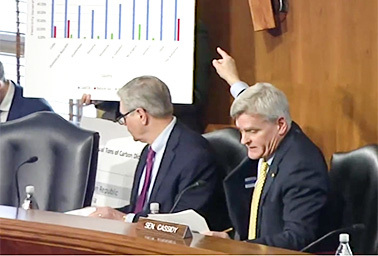 In press releases, in op-eds and during hearings on the Energy and Natural Resources Committee, on which he sits, Cassidy regularly brings up climate change unprompted — usually while touting the benefits of natural gas, a cleaner-burning fossil fuel than coal or oil and a resource that his state happens to produce, consume and export in large quantities. Cassidy's interest in climate change sets him apart from the bulk of his GOP colleagues, many of whom question the underlying science and regularly sidestep the issue entirely. And unlike the dozens of vulnerable House GOP moderates who have flocked to the bipartisan Climate Solutions Caucus, Cassidy has no need to insulate himself politically on the topic in his deep-red state. His lifetime League of Conservation Voters voting score is 7 percent. Yet, in a recent interview, Cassidy spoke of finding "common ground" with Democrats on energy policies that recognize the positive economic and environmental benefits of natural gas, which he sees as complementing greater use of intermittent renewables favored by the opposite party. "You get the health benefits of lower particulate matter, lower mercury and everything else, but you also get the ability to power a modern economy and you also enable, if you wish, the deployment of renewables," he said. "So it all works together." Unapologetically pro-fossil-fuel and dismissive of what he calls the "environmental left," Cassidy doesn't dispute the science of climate change, which he calls "valid." He points to the positions expressed by representatives of major oil and gas companies and chemical manufacturers who "come into my office and say they accept it," with the companies correspondingly spending hundreds of millions of dollars to protect their assets. "The fact that they are means a lot to me," he said. What Cassidy takes issue with are the solutions proffered to address warming. "What I'm just saying is, what are the practical means to address it?" he said last month. "And the practical means to address it by the left are absurd." Cap-and-trade emissions schemes and carbon taxes are a nonstarter for Cassidy, who sees the European Union as a cautionary tale. "The reality is, you can look at manufacturing jobs in the E.U. after they began to do their cap and trade, and there was a migration of that industry to China," he said, noting lax Chinese environmental standards and that nation's continued financial support of building new coal-fired power plants in other nations. "They're not serious about this," he says of China. "So what have we done about global greenhouse gas emissions? We've done nothing." By contrast, Cassidy's own recipe for reducing carbon emissions, outlined last year in an op-ed in The Daily Caller, calls for policies that encourage domestic manufacturing using natural gas. Not surprisingly, natural gas is a central focus of Cassidy's climate advocacy and stems from his days as a House member, where he said he had an "epiphany" that "the EPA was setting our energy policy." "EPA should not be setting energy policy," he said. "It should be Congress working with the president setting energy policy." Cassidy set out to identify policies that "create jobs for the American people and meet the concerns of the left about greenhouse gas emissions" and came to the conclusion that such "common ground" exists. "It's called natural gas," he said. Natural gas is hardly a novel solution to climate change; its role in reducing U.S. greenhouse gas emissions in recent years is frequently cited by industry and politicians to argue against regulations or carbon pricing schemes to control climate change. The Obama administration supported natural gas as a "bridge fuel" to a cleaner energy future, while also moving to regulate hydraulic fracturing to the extent possible under federal law. However, the relatively small carbon footprint of natural gas has long been clouded by estimates of widespread leakage of methane — a far more potent heat-trapping gas than carbon dioxide — from oil and gas operations, which critics say far outstrips any climate benefits from greater use of natural gas than coal. "Natural gas is fools' gold," said Bill Snape, senior counsel for the Center for Biological Diversity, in an email. "When you calculate total methane and carbon dioxide emitted from cradle to grave in natural gas production, transportation, and combustion, natural gas is no better than coal," Snape said. "Natural gas is not a viable climate mitigation strategy." Cassidy acknowledged uncertainty over methane leakage estimates but noted that improvements in technology are reducing overall emissions. "It's a little bit of a moving target, but fortunately, the target is moving in the right direction," he said. He's looked to expand natural gas use in transportation, including in vehicles and shipping, and earlier this year penned a letter to the U.N. Green Climate Fund arguing that the use of natural gas in infrastructure projects in developing countries "will ensure the highest decrease in emissions for the money invested." In March, legislation he authored to expedite small shipments of liquefied natural gas to Caribbean nations, S. 1981, passed the Energy and Natural Resources Committee on a bipartisan vote after Cassidy argued it would also support greater renewable energy development in the region by providing backup power. "If you want to enable American job growth, you should support this legislation," Cassidy said at the time. "If you want to decrease global emissions, you should support this legislation. If you want greater renewable generation, you should support this legislation." While the measure is relatively minor, Cassidy said he hopes to replicate the success through ongoing conversations with Senate Democrats. "I'm seeing some of my Senate colleagues on the left acknowledge, 'Huh, maybe we do need natural gas. ... Wait a second, you're right; we can't have renewables unless there's fast-acting startup behind it, particularly in places where the grid isn't terribly integrated,'" he said. Tangible progress may be incremental, but Cassidy is in it for the long haul. "I think we have so much to do to socialize the idea that you will decrease global greenhouse gas emissions with more widespread deployment of natural gas," he conceded. Cassidy's quiet climate advocacy drew praise from another Republican senator who often raises the issue unprompted — Energy and Natural Resources Chairwoman Lisa Murkowski. The Alaskan Republican senator laments the GOP's retreat on environmental protection in recent years. "I think that for perhaps a host of different reasons, Republicans have just veered away from the discussion about climate and more broadly the environment," she said last month. "And we have ceded that as an issue to the Democrats, which I think is wrong and unfortunate." Murkowski noted that she and Cassidy both represent energy-producing states that are already feeling the effects of climate change. "I think it's important that we be engaged on these issues, that we are there talking about environmental change, that we are in the forefront talking about the solutions, whether it is to help a state like Louisiana or villages in Alaska that need to be moved to higher ground because of the threats that they face," she said. Natural gas is fools' gold. Former Rep. Bob Inglis (R-S.C.), who since leaving Congress in 2010 has promoted conservative, free-market solutions to climate change, including as the executive director of republicEN, said Cassidy's advocacy on natural gas is smart. "Will it last forever, and will it someday be replaced by better batteries and better solar? Probably so," he said last week. "But in the meantime, it helps us reduce emissions, and it's a commodity that we can sell well from here in Louisiana," Inglis said. "So why not accomplish those objectives of increasing the wealth of my state and improving our situation with emissions?" Inglis, who has advocated for a revenue-neutral carbon tax since he was a member of Congress, also drew a contrast between Cassidy and another Louisiana Republican, House Majority Whip Steve Scalise, who recently introduced a resolution opposing a carbon tax. "What Cassidy's doing makes complete sense and is surely well representing the state of Louisiana," Inglis said. "And I'm wondering, what's happening with Steve?" Yet Inglis points to Scalise's resolution as proof of the success that he and other conservatives are having in shifting GOP thinking on climate change. "I'm not here to tell you that 'Oh, yeah, we're just on the cusp of success,'" he said. "We've got a long way to go, because ... my party is not conservative at this point. "It's a populist nationalist party, but I'm here to predict for you that that populist nationalism will [be] found out to be snake oil," he said. "And when it is, there will be a rebirth of conservatism."